Giovanni Battista Somis was an Italian violinist, composer, and teacher born (in Savoy-Piedmont – a then French-Italian state in northwest Italy of which Turin was once the capital) on December 25, 1686 (Bach was born the previous year.) Although rather obscure, many consider him a critical link between Arcangelo Corelli (1653-1713) and virtuoso violinists who came after him. It has been suggested that the connection follows this sequence: Corelli-Somis-Pugnani-Viotti-Baillot-Kreutzer-Massart-Wieniawski (1835-1880.) His first teacher was his father, Lorenzo Francesco, a violinist in the court orchestra of Duke Vittorio Amedeo II’s mother (Marie Jeanne Baptiste.) Somis' family was well-known for its important musical role at the royal court. (Lorenzo Francesco was also employed by the prince of Carignano, the duke’s cousin.) At age 10, little Somis was already playing in the orchestra as well. In 1703, at age 17, he was sent to Rome (by the Duke) to study with Corelli and he remained under Corelli’s tutelage until 1706 or 1707. He may also have studied with Vivaldi in Venice. 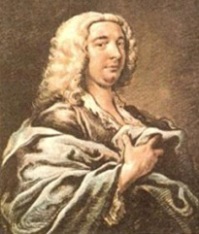 Upon finishing his studies, he became leader of the orchestra (at Turin) and eventually solo violinist to the king of Turin (1713) – the former Duke of Savoy, the same patron who had sponsored his studies with Corelli. In 1709, he was made an assistant at court to the prince of Carignano as well. Although he sometimes traveled with the royal household, he almost never ventured outside Turin after these appointments. He did play – in 1731 – a concert in Paris for the Concerts Spirituel for which he was highly praised. Records indicate that some of his music, though written in Turin, was intended for performance in Paris, where musicians from the Piedmont region were active. It is not certain how much music he composed; however, it is known that he published (between 1717 and 1750) eight collections of violin sonatas, some of them for two violins (Opus 5 and 7) – 78 sonatas in all. One source conjectures that Somis also wrote 134 concertos, although only nine survive (in manuscript.) In composition, Somis’ influence on the transition from Baroque to Classic styles is considered negligible. His pupils included Gaetano Pugnani and Jean-Marie Leclair. Somis died on August 14, 1763, at age 76. Joseph Haydn was 31 years old and Mozart was already six.